I got to go to the Borderline Club today to see REM get interviewed about their “Out Of Time” album. Here’s what happened. Fake news is the thing this week – or at least soul-searching about it is. I must say one of my favourite things on the web is the National Museum of Scotland’s collection of 17th century “Broadsides”, the pamphlets sold on the street. People loved stories about bad criminals and evil foreigners and true mermaid sightings then too. So it’s not just a new “ZOMG ECHO CHAMBER” technology thing. But post-Trump and post-truth, that’s where we are. This Washington Post interview with a fake news provider excited lots of interest. But then disappear down a wormhole as Dan Barker explains how some stats on the fake news Facebook problem were themselves fake news. Hashtag Awkward. Facebook has calculated some of its metrics wrong again, leading to a bit of a flap. Although, as someone pointed out, we’re still quite happy with other industries basing their numbers on a few people filling in a diary of what TV or radio they listened to. Abi Wilkinson is excellent as ever here, talking about how the alt-right manosphere has poisoned politics. I’ve got to be honest, I’m not a big fan of Stop Funding Hate. And why? Well, because it’s exactly the same tactic GamerGate used in trying to make commercial pressure damage editorial independence, in this case, remember, because they didn’t like some video game reviews. Bruce Lawson is leaving Opera. As I’ve said before, I think in total the lack of diversity in hiring is a bigger long-term threat to the news industry than anything the ad-funded model or tech giants are causing. It limits the types of stories we tell and crucially, it limits the way we choose to tell them. But this is another angle worth thinking about – the attrition rate that working in news causes among parents, especially women. Long hours cultures are not good for mums or dads. Of course, you know my grand unifying theory of the universe is that everything is f***ed because most organisational and institutional decisions are made by a tier of permanently exhausted middle managers who have small people living in their houses. An interesting read on “Why Chatbots are Disrupting UX” although to be honest, our Guardian chatbot is mostly disrupting not my UX but my sleep by making me get up at silly o’clock to write the news summary for it. People got excited about there being a new Quidditch Premier League but frankly, instead of running around with a broomstick between their legs, they should just play a proper sport like roller derby. Someone appears to have made a working piano out of Lego. Wimpy expert Ed Jefferson looks at what happens to underground, subway and metro carriages when they die, and manages to fit in a decent Paul McCartney joke as well. 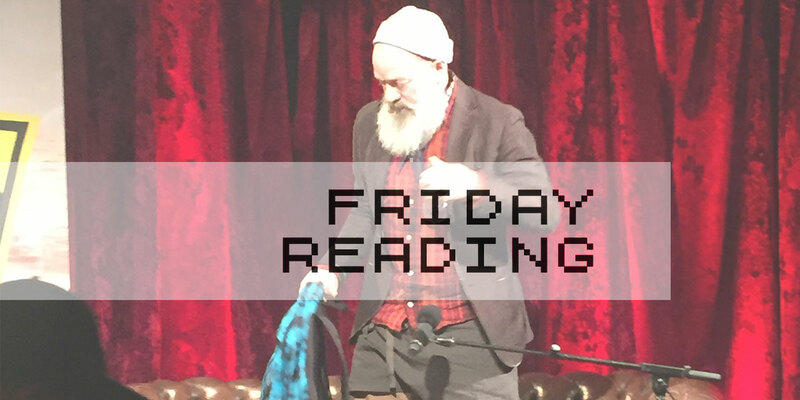 Friday Reading is a weekly series of recommended reads from journalist and designer Martin Belam, covering journalism, media and technology. Martin is Social & New Formats Editor for the Guardian in London. And very, very hungover, emotional and tired today.